Commercial Landscape Irrigation Tips: Peter Longman, Rain Bird’s Northern Europe Landscape Area Manager, takes a look at how irrigation systems are becoming an integral element of landscape design. Product selection and regular maintenance are essential. It seems that water restrictions and hose pipe bans may be more frequent over the coming years as predictions about global warming become reality. Whilst it is true that conservation of water is everyone’s responsibility, irrigation technology is likely to play an important role in ensuring this precious commodity is used to maximum effect in the commercial landscaping, sports and residential applications. With efficient irrigation products and practices, it is possible to reduce water consumption by 25 per cent or more without having to give up the plants and trees that add to the look of any landscape. A fundamental requirement is to know the soil type involved – is an important factor in determining how fast and how often irrigation is needed. Different soils have differing rates of water intake as well as being able to hold moisture for varying amounts of time. These factors will influence the choice of plants as well as the type of sprinkler or other form of irrigation and will also influence the irrigation schedule. Finding out about a particular soil type does not require expensive lab tests and DIY soil testing is easy, using a jar test to measure soil texture and type. Water pressure can vary greatly between locations. High or fluctuating pressure can have an impact on the efficiency of an irrigation system. If there is no high pressure, it is important to install products equipped with pressure regulating devices, which can make significant water savings per minute per device. The quality of water can vary too and in some areas ‘reclaimed’ or ‘recycled’ water is available for irrigation purposes, requiring special products that stand up to the harsh chemicals that can be found in that type of water. One way of conserving water and helping plants to stay healthy is to spread mulch in shrub beds, tree rings and flower beds. This helps drainage, encourages root development and improves the soil by making nutrients more available to the plants. As different types of plants and shrubs within a landscape will need differing amounts of water, one approach is to divide a property into separate zones so that groundcover, shrubs and trees can be watered separately and less frequently. For some installations, drought-tolerant plants may be favourable whilst the use of grass with its higher irrigation needs, can be reserved for areas with high value or visual prominence. In an existing installation, one of the most important tasks is to evaluate its performance. Check regularly for leaks as small ones can go unnoticed for long periods, potentially causing costly water wastage. Technology is available to detect and fix these leaks whilst a central irrigation controller that monitors an installed system with real-time alerts will indicate problems, allowing broken heads or damaged lines to be fixed immediately. Flow sensors will help limit the liability caused by water loss through damaged pipes or faulty valves. With the development of new technologies, adjusting irrigation schedules in accordance with real-time and predicted weather conditions is now a reality. This allows water to be saved whilst maintaining a healthy landscape. It is estimated that daily adjustments based on weather can save an average of 30-50% in water consumption for irrigation each year. 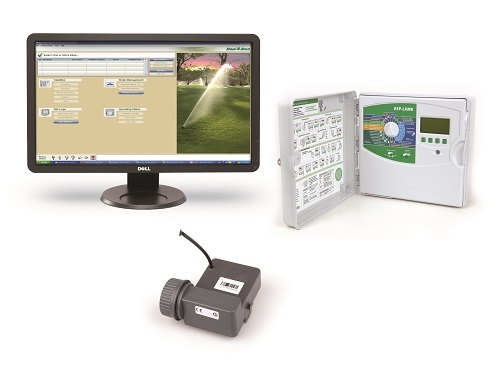 Starting with a weather station based irrigation system, a smart controller automatically adjusts the watering schedule to take into account both current and predicted weather conditions.This allows the controller to water plants optimally year round without the need to constantly reprogram the controller. A rain sensor can also be used to stop or delay irrigation in the event of precipitation. Modern controllers’ seasonal adjust feature will turn watering times down as seasons and conditions change. All these features will help to prevent over watering, excess run-off and unhealthy landscapes. It is normally better to irrigate in the early morning when the sun is low, winds are calm and temperatures are cool. Midday irrigating tends to be less efficient due to evaporation and wind drift. Irrigating in the evening is not a good idea either because leaves can remain wet overnight – an open invitation for fungus to grow. Wind drift interference is just one phenomenon that should influence the selection of irrigation products. It is most likely to occur during the middle of the day and even small amounts of wind can cause water used for irrigation to drift, evaporate and be wasted. Pressure regulating sprays and rotors combined with thick streamed nozzles, such as R-VAN, can help reduce the effects of wind drift. Keeping water in a tight place and hitting the target zone will also prevent wastage. Irrigation systems are usually set to keep plants alive in the most inefficient areas of the system, which means that the plants in other areas may get too much water. Applying more water than the ground can absorb leads to excess water running off and technology such as Cycle+Soak on Rain Bird controllers will split watering times into a few shorter periods, so water has a chance to soak in. 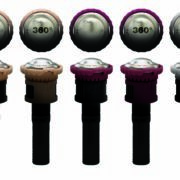 For slopes and hills, the use of lower-flow rotary nozzles will provide a solution. As different types of emitters apply water at different rates, it is important to make sure water is being applied evenly and not overwatering some areas. The use of sprays and rotors with matched precipitation rates are available and are designed to be used together in the same zone. Running a system with too much pressure creates misting and excess flow, which can result in water wastage but by adding a pressure regulation to sprays and rotors allows nozzles to perform as designed, delivering the right amount of water. 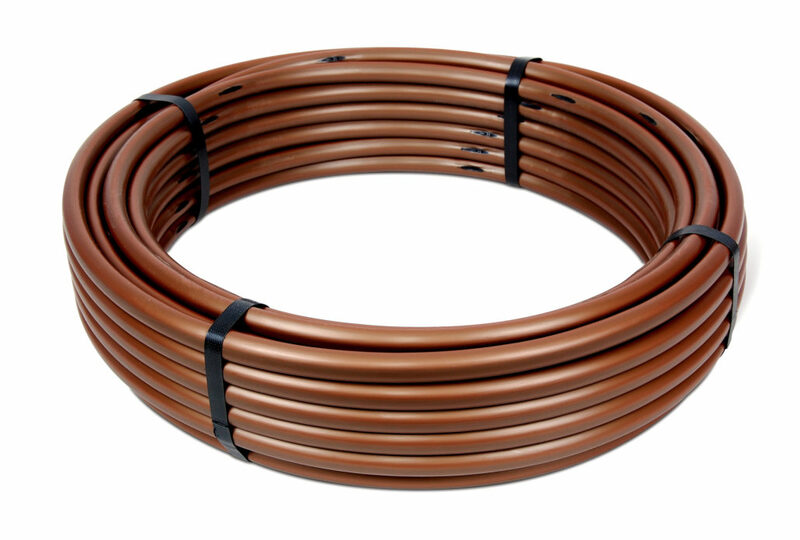 The popularity of drip irrigation systems continues to increase as the industry recognises its benefits. Not only does drip irrigate plants directly for the most effective watering, but also ensures that virtually no water is lost through evaporation and water run off is minimised. Converting flower beds and shrubs to drip can on average, save 50% compared with over watering with traditional sprays. For grass, subsurface dripline is installed 3-4 inches below the surface to deliver water directly to the roots. Dripline subsurface for trees and large shrubs offers the benefit of water savings and can also result in larger, healthier plants. Until recently, however, using drip irrigation on sloped landscapes had been problematical because of the pooling and consequent soil erosion or drainage issues that could be caused at the bottom of the slope. This is a result of water continuing to flow out at the lowest point after the drip system has been turned off. A new dripline system that is kept effectively charged along the entire slope, whilst simultaneously stopping water escaping at the bottom, is now available. Maintaining just the right levels for water pressure and water flow are also essential to attaining maximum efficiency from any dripline system and drip control zone kits for a range of flows are readily available. Sand, grit and debris can affect the performance on low-volume drip emitters, leading to clogs and wasted water. Filtration systems will clear these harmful elements so that clogging is never an issue. An understanding of the soil, the landscape, the water supply and the local weather are key to effective irrigation. Once these are taken into consideration, proper maintenance and specification of the most appropriate and practical irrigation systems, controllers and programming software will make a major contribution to the preservation of a landscape.